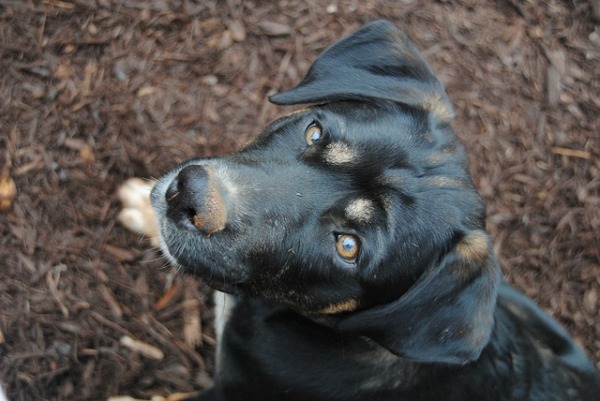 Dogs are certainly valuable family members, but they sure can wreak havoc on a yard. Your best bet is to install as much hardscape, like pavers, as possible, but with grass-loving kids at home and a desire for backyard color, this is not always a realistic option. To help you determine the best options for your situation, we will address issues commonly faced by dog owners, recommend grasses, living ground covers and non-living ground covers, and provide a variety of tips for maintaining a yard that meets the needs of your dogs without sacrificing visual appeal or overall function. Nervous or protective dogs tend to wear paths along fence lines as they pace. Whether it’s just for fun or another reason, dogs can and do dig up prized plants in a matter of minutes. Brown spots in grass or stains on concrete appear frequently due to urine. An inability to grow grass, ground covers or other plants may arise in high traffic areas. Some ground covers, such as natural grass and some wood products can worsen flea infestations. Homeowners who need to let their dogs out to play or use the restroom during or after rain may often have an issue with mud being tracked into the house. The American Society for the Prevention of Cruelty to Animals (ASPCA) maintains lists of plants that are toxic to dogs, cats and/or horses. Check the list before selecting plants, because if Fido started gnawing on a common calla lily, you’d find yourself with a hefty vet bill. You might be surprised at just how many common landscaping plants have some level of toxicity for cats and dogs. In many cases the symptoms are limited to vomiting or diarrhea for a short period of time, but in other cases consuming these plants may lead to serious health issues or death. Therefore, all pet parents should thoroughly research any plants they plan to use in their landscaping design. Keep in mind that there is no truly pet-proof ground cover, but if you are looking for something to plant between stepping stones or in small backyard areas, these are good choices that will stand up to light or moderate pet and human traffic. The dymondia margaretae in the above photo gets trampled by children, adults, and a 70-pound dog on a daily basis in La Jolla, CA. It is also perpetually run over by scooters and tricycles. This silver-green leaved ground cover sprouts yellow flowers in warm weather and grows low to the ground, so be sure to plant it exactly at the level you would like it. If planted in an area where the dog runs, expect it to look patchy, but it will do its best to survive. It is best to use this option in smaller areas, such as between stepping stones, for the most satisfactory result. This soft, mat-like ground cover can take partial or full sun and requires consistent watering that will need to increase with temperature. 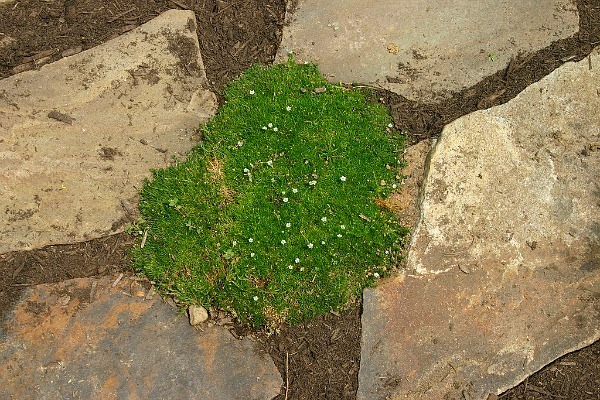 Durable Irish moss grows about an inch tall and sprouts little white flowers in the spring and summer. 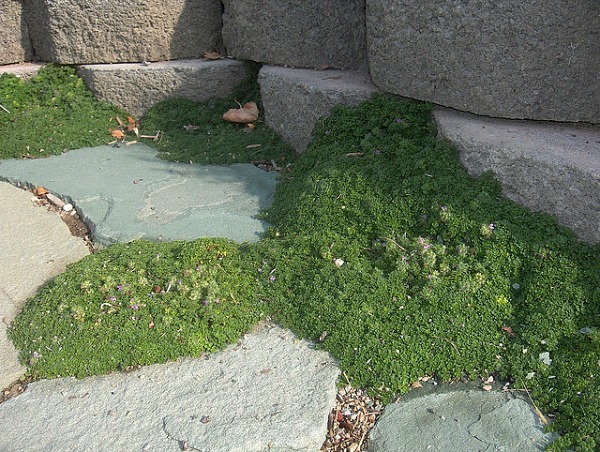 While this is an attractive, popular alternative to natural grass, it should be noted that mosses are not drought tolerant and, therefore, are a better choice for areas that receive regular rainfall. If you live in a drier area, such as Southern California, you can save water by installing an irrigation system and setting it for deeper, less frequent watering sessions. This ornamental herb smells nice and is completely edible. Elfin thyme grows to two inches tall and is a gorgeous addition to rock gardens and container gardens, where it cascades over the sides. Thyme’s dense, hardy nature allows it handle light to moderate human and animal traffic; however, it will not fare as well in areas where children or pets play, roll around and roughhouse. As an added bonus, elfin thyme produces pretty, purple flowers in the summer. This tiny, lesser-known sedum (hence, no photo) can take quite a bit of foot traffic and reseeds itself, if damaged. Tiny leaves form a tight mat with small yellow flowers appearing in the summer. You can purchase miniature stonecrop by the flat and place plants no more than one to two inches apart in order to encourage it to form a mat and cover the area. Miniature sedum works well in drought-tolerant gardens. Labrador violet sure has a fitting name for the purpose of this article! Use it as filler between stepping stones, not larger scale applications, because it is slow to spread. Native to Greenland, this plant does well in colder climates with purple flowers blooming in spring. 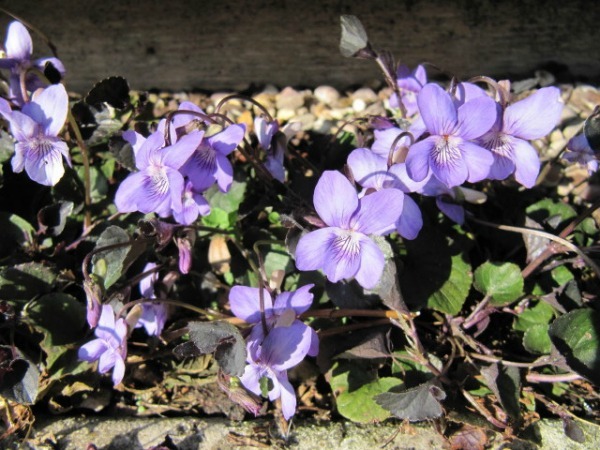 Labrador violet grows to roughly eight inches tall and wide and can take daily, light foot traffic, which makes this a good option for those in search of a taller ground cover with blooms. This relatively drought-tolerant ground cover grows well in full sun or partial shade. 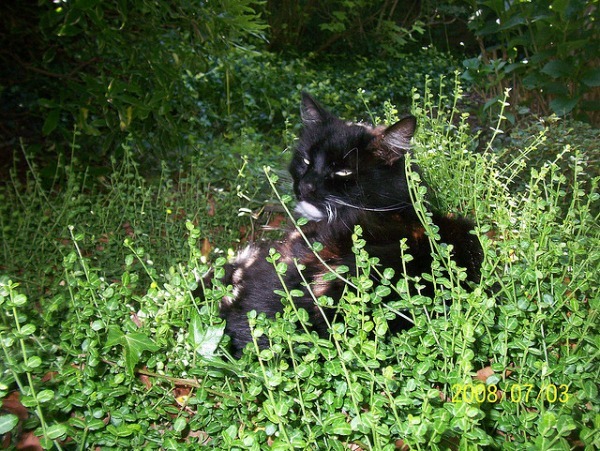 Its hardiness makes it a more pet-friendly ground cover. In fact, this option can grow and spread so well that you might want to consider installing a landscaping border to contain it. 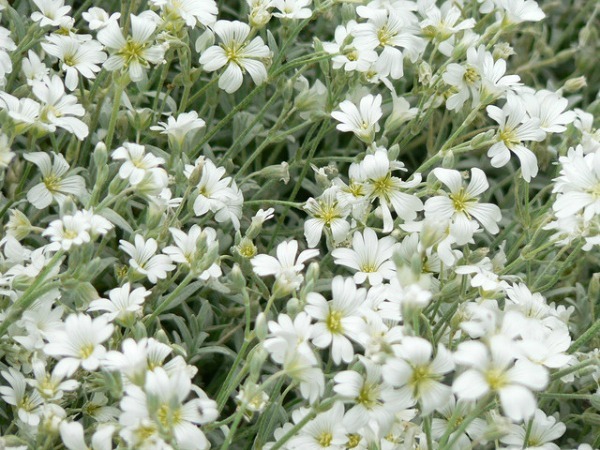 White flowers and silvery-green leaves mimic winter tones when they bloom in early summer, hence the name. Snow in summer grows to six inches tall and is excellent choice for between pavers. The added bonus with this one is that it is deer resistant, so if you find that the local wildlife is eating your landscaping, you may want to replace other ground covers with deer-resistant options like this. The experts at Lowe’s like euonymus fortunei in yards with pets because it is tough to destroy and can grow in either shade or sun. Yes, that is a cat, and evidently they love laying in euonymus fortunei, which can grow up to six inches tall. This option is relatively easy to find, grows quickly and can withstand traffic well. No live grass is immune to brown spots, digging and excessive play. 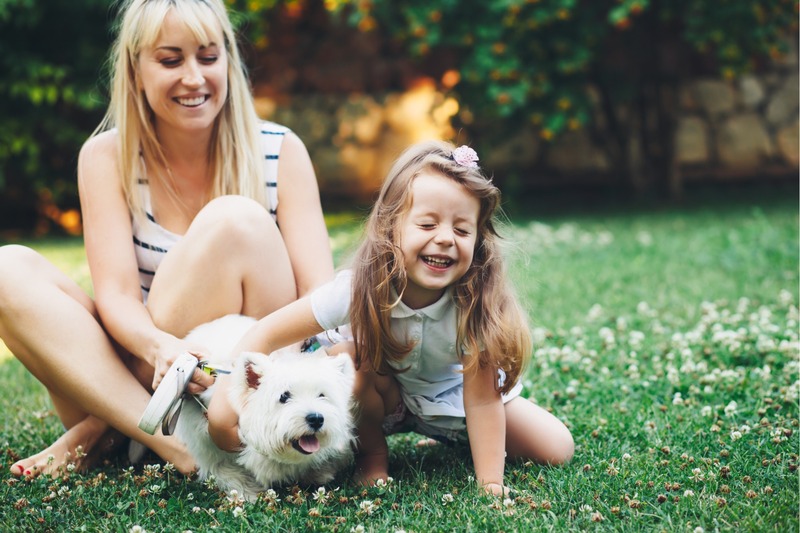 If you share your home with one or more dogs and really want to keep a natural grass lawn, you may have to dial down your expectations of a perfectly manicured, golf course-worthy lawn and consider one of these options for the best results. Buffalo grass is now marketed in places like Southern California as a low-water, drought-tolerant grass. You can buy buffalo grass as seed or in plugs by special order at many local nurseries. Though the slender grass looks fragile, in fact, it is far from it and grows to three inches tall while requiring very little care. This grass can reseed itself and withstand high traffic, though its more suitable for cooler climates. Kentucky bluegrass seed is also used to patch bare spots in other types of lawns because it grows quickly. This, of course, is always a plus when trying to maintain a balance between happy dogs and an attractive lawn. University of California, Davis issued a report stating that tall fescue tolerates lawn burn from pet urine better than other grasses, which is great news for dog lovers. Because tall fescue is deeply rooted and has wider blades than other grasses, it can also take serious traffic. Reseed patches with Kentucky bluegrass, since tall fescue is a slow-grower. Because St. Augustine grass has deep roots, this might be a good alternative if you have a dog who loves to dig. This grass, however, will not tolerate high traffic or excessive pet urine. Tip: If you catch pet urine quickly after it happens on the lawn, water it down to decrease the intensity of the brown spot. If you do not want to hassle with maintaining a live lawn, consider what many dog facilities are installing: pet turf. Dog lovers who choose artificial grass never again have to worry about brown spots or bare patches, and digging is rarely an issue. Additionally, it is easy to clean after your pets use it as a restroom and provides a level, smooth surface with fewer tripping hazards for safer play time for pets and children. If you are the one who generally cleans up after the furry or little ones, you will also love that there are no wet blades of grass or mud to mop up off the floor when they come in from playing on your lush, green lawn — even right after it rains. Make sure your turf installer applies a deodorizer to help absorb pet urine odors along with a membrane to allow air circulation between the turf and base. Also, have the installation team add deodorizer to the top of the installation for added protection. And, no, pet turf does not look anything like old-school Astroturf — it looks like natural grass! Living ground covers are often the first choice for homeowners, whether or not they have dogs or other pets. However, they are not always worth the hassle and require more water and maintenance than non-living options. Therefore if you would also like to have drought-tolerant landscaping, want to worry less about digging, or would rather spend less time maintaining your yard and more time enjoying it, you may want to choose a low-maintenance option, such as the above-mentioned artificial grass, gravel, wood chips or mulch. The trick is to find the best solution for your particular situation. It is often the case that the best solution is a combination of ground cover options. For example, you may find that you can meet your needs and your dogs’ needs best by having a lawn area, gravel area and dirt area. Or you may find that your dog enjoys spending time on hardscapes, such as a paving stone patio or a wood deck, and only needs a small softscape area for playing and bathroom purposes. Another solution that works for many dog lovers is use pet-friendly ground covers in most areas of the yard, while adding island flowerbeds or borders along the fence where you can add the texture and color of more interesting plants to enhance your yard’s visual appeal. Here are a few non-living, dog-friendly ground covers to consider for a drought-tolerant, low-maintenance backyard. Gravel: Gravel may or may not be a good option for your dog, depending on a few factors. Dogs often enjoy sunbathing on warm gravel on sunny days, but if you do not have adequate shade, an area that is entirely gravel could burn your dog’s paws or cause them to feel the heat more intensely on hot days. Yards with shade are good candidates for using gravel as a ground cover over larger areas. You may find that some larger dogs will have issues with small gravel getting stuck between the pads of their paws. This is not always an issue but should be considered. A bonus to choosing gravel is that it is easy to pick up solid waste and liquid waste will drain to the soil beneath. Wood Chips or Bark: Wood chips and bark are a bit of a mixed bag in terms of dog-friendly landscaping. On the one hand, they offer a low-maintenance, durable option that can easily withstand heavy traffic and can simply be raked back into place once your dogs have created regular pathways where they patrol or chase each other. They are also inexpensive, attractive and drought tolerant. On the other hand, some wood products can harbor flees, give dogs splinters or become your dog’s favorite snack. Cedar wood chips are a product that actually repels fleas, which makes this a popular choice for dog runs and dog-friendly yards. However, if you are considering going with cedar, be sure to bring in just one bag at first to make sure that it does not irritate any allergies or respiratory ailments that your dog might have. For most dogs, cedar wood chips to not cause breathing issues, but it is worth testing out before you fill your yard with them, and then find out your dog cannot tolerate them. It is commonly believed that the dyes used to color many widely available wood chips and bark is not toxic to dogs; however, it is best to choose wood products that are not dyed if you have a dog that likes snack on them. Dirt: Yes — good, old-fashioned dirt is an option. While you may not want your entire yard to be dirt — and we certainly do not recommend that — you may find that leaving a designated dirt area for your dogs is the perfect solution for your yard. This provides them with a place to roll around, use the restroom and dig as much as they please without harming the rest of your landscaping. 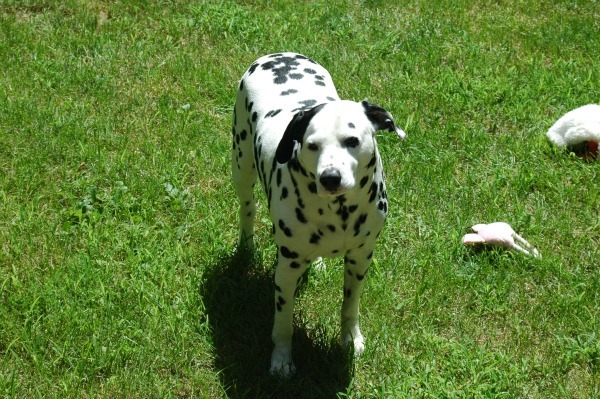 There is no grass or ground cover that can survive a digging dog, so let’s discuss how to solve this tricky problem. Dogs dig to find cooler soil when they are hot, to chase the scent of a rabbit or other animal, when they hear insects below ground, when they are bored, or if they are nervous. Experts agree that a well-exercised dog is a calmer dog; therefore, a solution as simple as more frequent trips to the dog park or a longer walk or two during the day just might bring digging to a halt. If frequent exercise does not get to the root of the problem, observe your dog to see if you can figure out a pattern. For example, if your dog digs on hot days, make sure there is a cool bed available. If she or he tends to dig only on days when you are away from home, it could be triggered by separation anxiety. Digging is more prominent in some breeds, like terriers and dachshunds, and there may be nothing you can really do to curb that behavior. 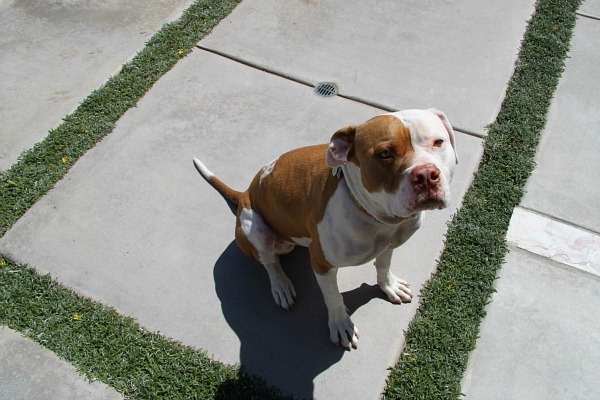 When this is the case, create a designated digging area in the yard that your dog will find appealing and where they can fulfill their need to dig without destroying your landscaping. You can then work on redirecting undesirable digging to the designated digging area or by providing them with toys to keep them entertained and occupied. Make sure there is enough shade, as well as a cool spot for your dog to rest, especially in order to prevent digging to find cooler soil. Train your dog to relieve himself or herself in a designated area (we know, easier said than done). Use natural pest control methods to avoid accidental ingestion of chemicals. Tip: When moving into a new home or getting a new dog, observe your dog’s behavior for a few weeks before investing in new plants or hardscape. For example, if there are areas where he or she likes to pace, consider adding pavers or gravel there. It is easier to maneuver around the dog’s current habits than it is to teach them new ones! Do you have any dog-friendly ground covers or backyard solutions to add?